If pork is the other white meat, then lamb might well be called the other dark meat. A favorite in Argentina, it seems to not be as familiar to American cooks or diners. Just take these statistics from the American Lamb Board, which confirms that Americans consume only one pound of lamb per year, versus 54 pounds of beef. These eaters clearly haven’t tried lamb with our Chimichurri, or it would be their new favorite. Thankfully, New Zealand lamb is also quite delicious, and it is available in the United States. New Zealand lamb most closely resembles Patagonian Lamb in its size and flavor profile, likely due to their nearly identical grass fed diet and wild, free-range lifestyle. For the purposes of this blog, I’ll focus on the preparation of New Zealand lamb, since it is the closest substitute for Patagonian lamb, and it’s the variety we serve at our restaurant. New Zealand lamb: Six to seven months old; pasture raised; grass fed; and grass finished. All of these qualities contribute to its very distinct flavor. Australian lamb: A bit older; also grass fed, but when necessary, supplemented with grain. One would think that because these animals are older, the flavor of their meat would be gamier, but the grain in their diet actually gives them a milder flavor. Domestic lamb (most commonly from Colorado and the Midwest): much larger; as with most domestic beef, these animals are fed a diet including grain, mostly corn; making them the least gamey of all lamb meat available in the United States. Tastes vary widely. Home chefs should experiment to see which type of lamb they prefer. In my family, we happen to love New Zealand lamb racks. They’re small and melt-in-your-mouth tender. So we recommend using them for this preparation. Remove the racks from the packaging. Pat them dry. Slice the rack into individual chops by cutting in between each bone. Rub the Chimichurri over the chops. Place in a glass or stainless steel container and refrigerate for 24 hours. 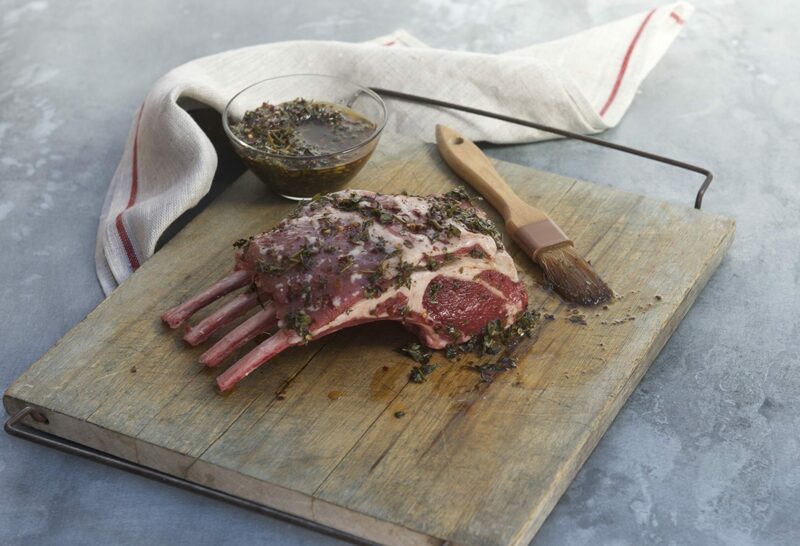 If using Colorado lamb rack, marinate for 48 hours, due to the larger size of the rack. Before grilling, remove the ribs from the marinade and pat dry. Season liberally with salt and pepper. Prepare a gas or charcoal grill. Lightly grease the grill rack with a neutrally- flavored oil, such as a vegetable oil or spray. Heat the grill until medium hot. Place the chops on the grill, with the bone facing 10 o’clock (yes, as in a clock). Cook one minute. Move the chop (on the same side) to the 2 o’clock position for one minute. This will create nice grill marks. Flip over the chops over. Continue to cook for another two minutes for medium rare meat. Remove the chops from the grill. Brush with more Chimichurri.